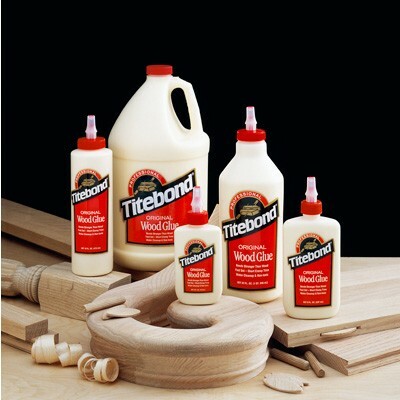 Why is selecting the correct wood glue important? There are many types of wood glues. 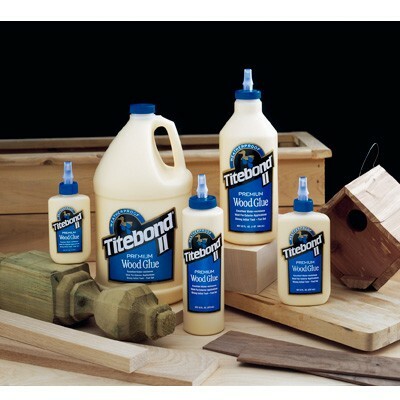 The standard yellow wood glue, often called “carpenters glue”, is a great product for most indoor wood projects. That being said, would it be a good choice for wood projects that are used in outdoor applications? For outdoor projects there are two choices, water resistant or waterproof. Say you are building some wooden deck chairs that are kept under a covered porch. They may get wet occasionally but are not out in the elements 24/7. For this application water resistant wood glue would give you secure adhesion without the concern of a glue failure. 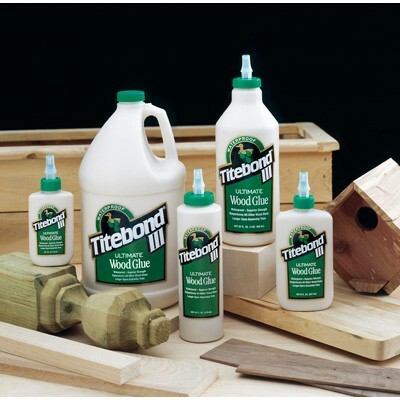 But, if you are building bird houses, planters or other outdoor projects that are in the elements all of the time, then you should use a waterproof wood glue. Waterproof wood glues can also be FDA approved for indirect contact with food and a perfect choice if you are building cutting boards for your kitchen. 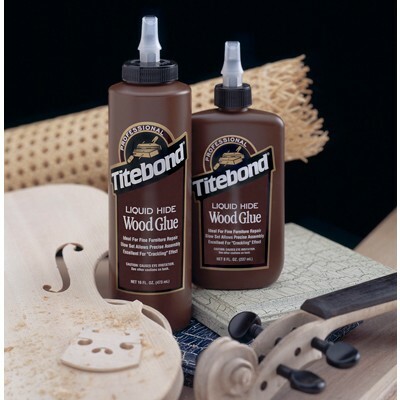 Because many types of wood glue will not release after curing, hide glue is your choice when building wooden instruments, fine furniture or adhering wood veneers. Hide glue will release when heat and moisture are applied to a joint or a veneer. Fine instruments and furniture are then able be repaired if need be for long into the future. Let’s say you are building a beautiful cherry wood hutch and plan applying a crown molding at the top edge. The best glue for this application wood molding glue because it is designed to be thicker and will not run or drip when applied to the face of a vertical surface. There are many variables with regard to open times, assembly times, temperature ranges, humidity and more to get the best results for your specific project. Be sure to review the specifications and application directions before use to zero in on the best wood glue for your project. Not cleaning the surfaces of the pieces to be glued. Dust, dirt, oil etc. must be removed to ensure good adhesion. Applying too little glue runs the risk of a failure. If excess glue is applied it will squeeze out of joints when clamped and then easily cleaned up when wet. Joints and edges of glued pieces not being lined up when clamped can be a big problem because most wood glues are not reversible; meaning once they cured the joints cannot be moved. Wood glue does not take stain. Any dried glue on the edges or face of your workpiece needs to scraped and sanded thoroughly to ensure that there will not be obvious voids in your staining. Assembly Time: Assembly time refers to the time lapse between glue spreading and application of pressure. Chalk Temperature: In a wood glue, the particles of adhesive are suspended in water. When it dries, the loss of water pulls the particles together with enough force to form a continuous adhesive fill. If the drying temperature is below a critical point, the effect of the water evaporation is not enough to pull the particles into a continuous fit. The particles are not joined together and are left in the joint. The dried film in the joint will appear white than normal. This is known as chalking, and the critical temperature is the chalk temperature. When chalking occurs, the glued joint loses strength. Freeze - Thaw Stability: Freeze-thaw stability means that the product will go through 5 freeze-thaw cycles before becoming unusable. Some wood glues will have a “cottage cheese” look after one freezing. When this happens, stirring will bring the glue back to a normal thickness. Clamp Time: Clamp time is dependent on wood species, moisture content and environmental conditions. For edge & face gluing: 2-4 hours. Cure time on most glues: 24 hours. 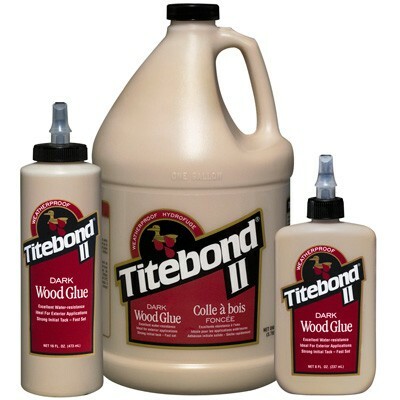 Do not use metal tools with any Titebond wood glue. Iron may contaminate the glue and darken the glue line. Iron will not, however, adversely affect the strength of the glue. Care should be taken to ensure a tight fit between wood pieces with no saw marks and no burnishing of the surfaces to be glued. Clamps should be positioned a minimum of 1-1/2-2 inches in from sides and evenly spaced at 8-12 inches throughout piece. Still have questions? 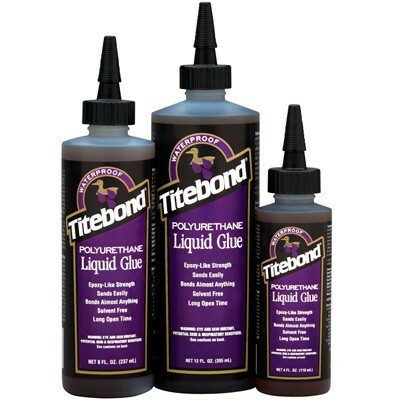 Check out our handy guide on the different varieties of Titebond Glues! Can be used on wood, hardboard, high pressure laminates, particleboard, leather, supported vinyl, cloth, paper and many other porous materials. For use on wood-to-wood and on most other porous materials where a water resistant glue is required. Limitations: Titebond II passes Type II water-resistance tests. Titebond II is not recommended for continuous submersion or for use below the waterline. Because of the variances in the surfaces of treated lumber, it is a good idea to test for adhesion first. For use on wood-to-wood and on most other porous materials where a water-proof glue is required. Limitations: Titebond III passes ANSI/HPVA Type I water-resistance tests. 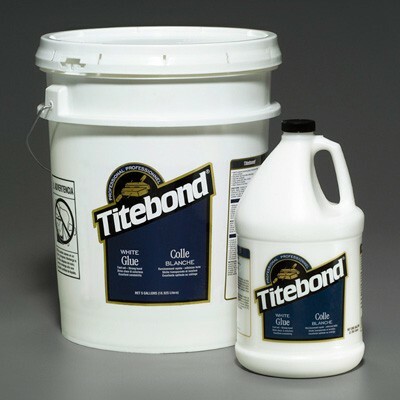 Titebond III is not recommended for continuous submersion or for use below the waterline. Can be used on wood, hardboard, high-pressure laminates, particleboard, leather, supported vinyl, cloth, paper and many other porous materials. The thickest, fastest-drying glue available for use with porous and semi-porous materials. . Ideal for finish trim, crown molding, baseboards, window casings and other applications requiring a professionalstrength, no-run wood glue. Allows for easy disassembly (ideal for antiques and instrument repair). Can be used on wood, hardboard, high-pressure laminates, particleboard, leather, supported vinyl, cloth, paper and many other porous materials. Also used to create a “crackling” effect on wood and other surfaces. Water-based, nonflammable, low odor, dries clear and cleans up with water. Its thicker formulation offers fewer runs and drips, making it easier to use and more effective for precise assemblies. 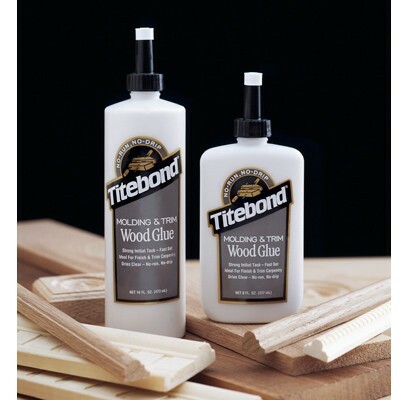 Titebond Melamine Glue is designed for bonding wood, particleboard, MDF and other porous substrates to synthetic materials such as melamine, vinyl and HPL as well as metals. Professional-strength, waterproof glue specifically designed for multi-purpose applications. Twice as thick as traditional polyurethanes. Versatile performance! Ideal for wood, metal, plastic, ceramics, HPL, stone, Corian®and more. Exceptionally strong, economical white glue that sets faster than most other comparable glues. Strong initial tack and sets fast to reduce clamp time. It provides a translucent glue line, offers excellent sandability and is unaffected by finishes. 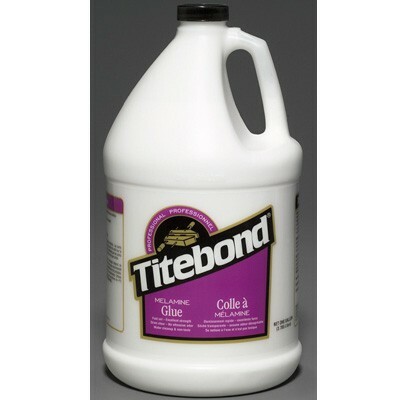 Titebond White Glue is easy to use, non-toxic and cleans up with water.